The Multi-Level Authorization functionality provides the capability to create payments and conversions that will only be executed after a pre-specified number of approvals have been provided. If an account is enabled for multi-level authorization, the user should be able to view any conversions and/or payments that are pending authorization on the “To Do” page of the application. 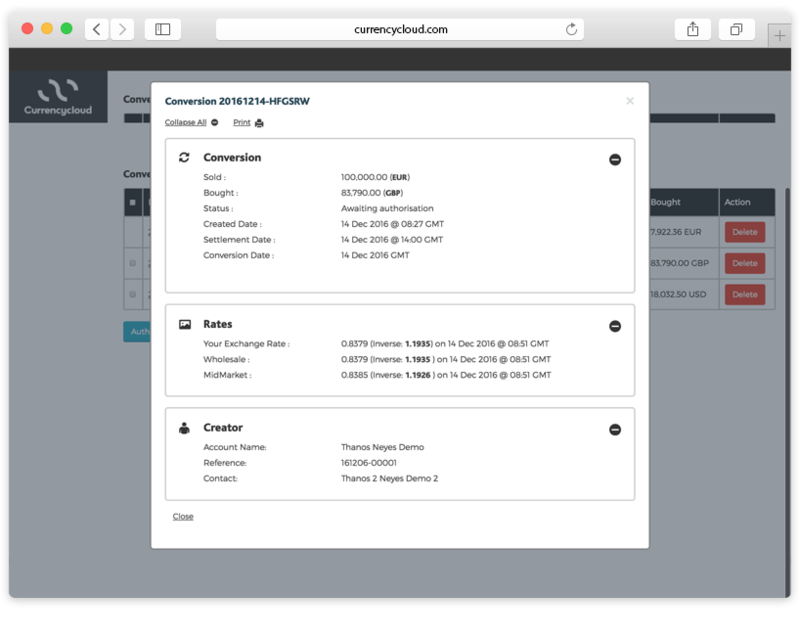 The conversions and payments pending authorization are shown in two separate tabs and depending on the account setup, both or any of the two tabs may be visible. 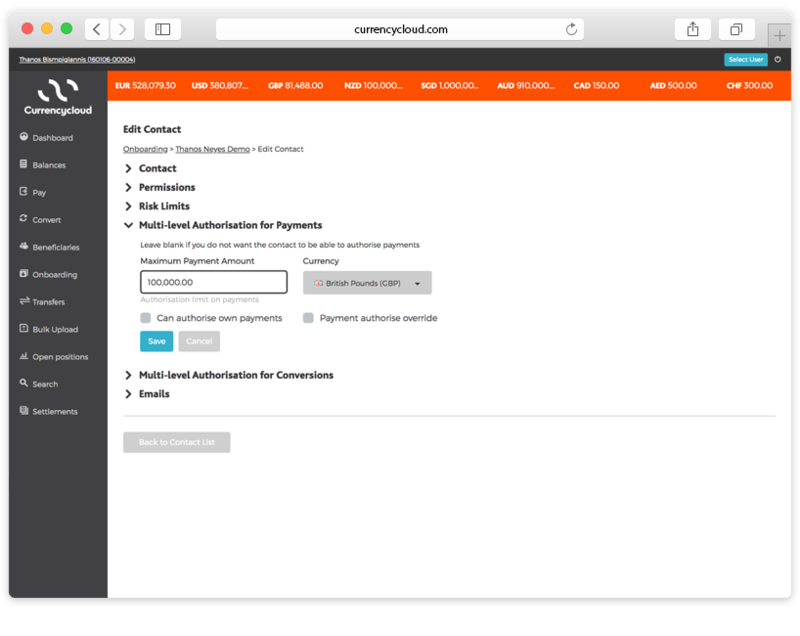 On each tab, the user can view the payments or conversions that are pending authorization. A “select” checkbox is only available for the conversions and payments that the user can authorize. By clicking on a row of the table, the details of the corresponding payment or conversion are shown. 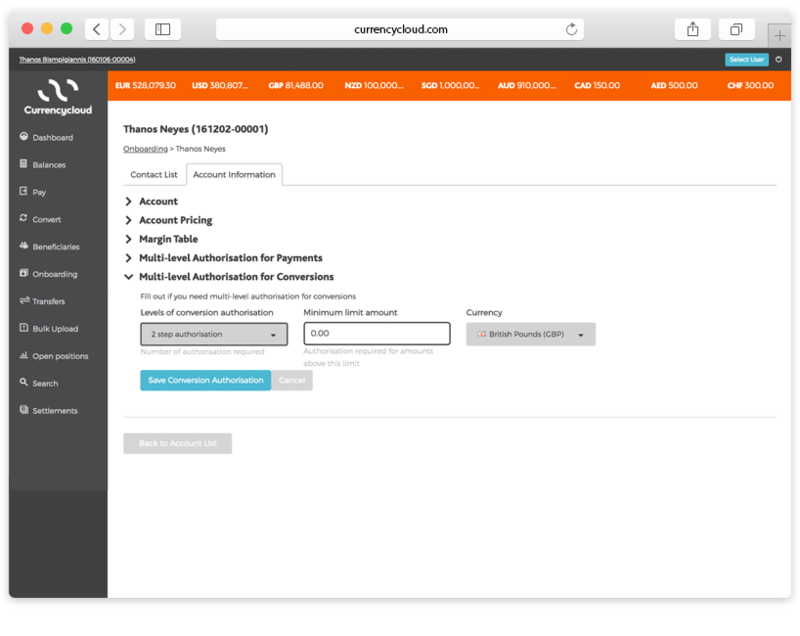 After selecting the payments or conversions, the user clicks the “Authorize” button. A confirmation message is shown on the screen and the fully authorized payments or conversions are removed from the table. Conversions that are pending authorization do not have a fixed conversion rate. The rate is only fixed after the last authorization step. Any rate provided in previous authorization steps is indicative only. 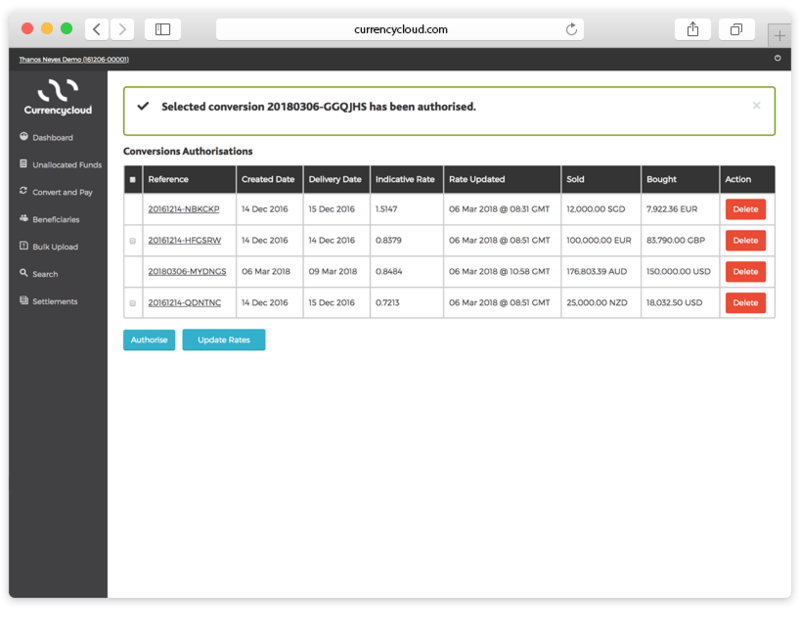 Before a user authorizes a conversion, they can get updated FX rates by clicking on the “Update Rates” button on the Conversion Authorization tab of the “To Do” screen. If something goes wrong with the authorization, an error message is shown on the screen. In order to add a payment to a conversion, the conversion needs to be fully authorized. Depending on which side is fixed, the buy and sell amount of a conversion will not be fully defined until the conversion has completed authorization. 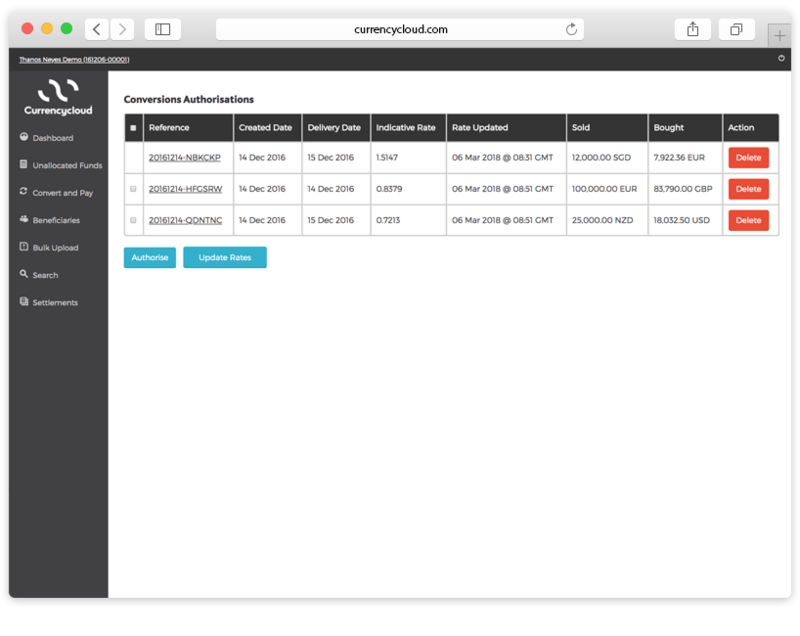 When creating a new account (or editing an existing one), the account can be enabled for conversion or payment authorization by using the corresponding sections on the “Create/Edit” account page of the Currencycloud Direct application. Levels of authorization: Specifies if the account is enabled for payment and/or conversion authorization. If it is enabled, this also specifies the number of authorization steps required for a payment or conversion to be executed. Minimum limit amount: This is the amount at which a payment or conversion will require multi-level authorization in order to be executed. If the conversion or payment is lower to the minimum limit amount, then it gets executed directly without the need for authorization. Please note that if the value is “0.00”, all payments or conversions submitted in the account will go through the defined authorization steps. Currency: This is the currency of the minimum limit amount. The currency can be defined as GBP, EUR or USD. If the conversion or payment is of a different currency, then it will be converted to the selected currency and cross-checked with the minimum limit amount to determine whether or not authorization is required. If an account is enabled for Multi-level authorization, the contacts of the account can be enabled to authorize payments and/or conversions. The corresponding sections for multi-level authorization contact setup will be visible depending on the account setup. As an example, if an account is enabled only for conversion multi-level authorization, then only the multi-level authorization for conversions section will be available on the contacts create/edit page. Maximum conversion/payment amount: This is the maximum amount that the contact can authorize for a conversion/payment. Currency: This is the currency of the maximum conversion/payment amount. It can be one of the following: GBP, EUR, USD. If the conversion/payment currency is different, then the amount gets converted to this currency in order to check if the user can authorize the conversion/payment. Can authorize own conversions/payments: If this setting is enabled, the contact that created the conversion/payment can authorize it across all the authorization steps with the exception of the last one. The last authorization step will need to be executed by a contact different from the one that created the conversion/payment. 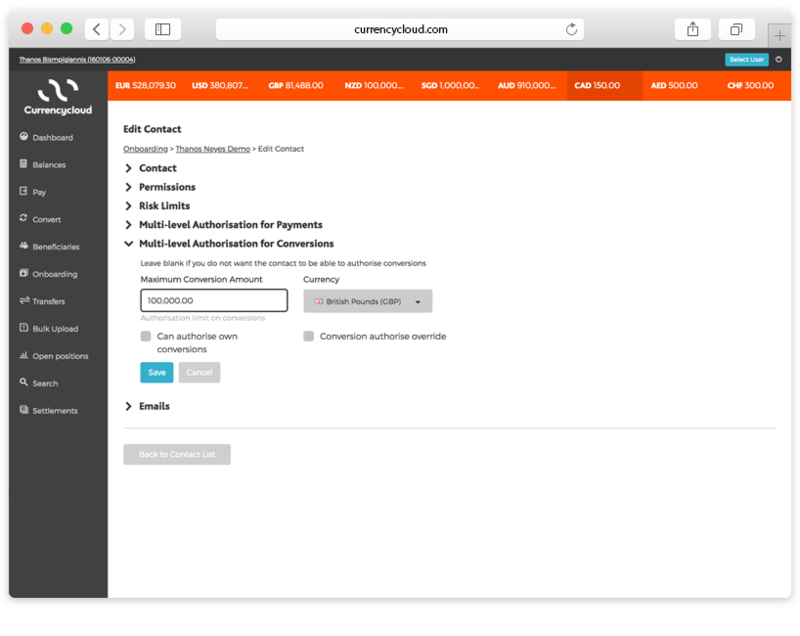 Conversion/payment authorize override: If this setting is enabled, the contact can override the authorization steps and fully authorize the conversions/payments they create.